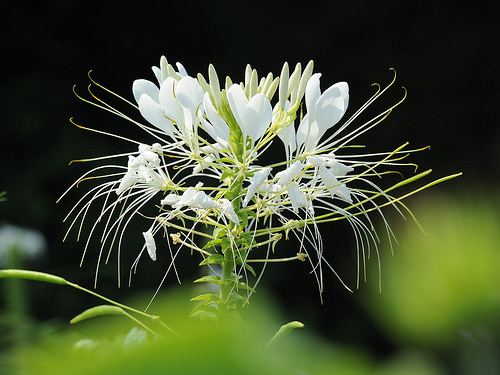 Previously I have only stocked Cleome ‘Violet Queen’ which has been rightly popular for reliability and strong colour, but the tastes of my ever more sophisticated customers has led me to stock a pure white Cleome. Cleome ‘Helen Campbell’ was clearly the best choice for this. ‘Helen’ is a very well behaved half-hardy annual. Surface sow the seeds in early spring on moist compost…keep moist and be patient….just when you think the seedlings won’t turn up, they do. These seedlings will evolve into beautiful floriferous gems. Some folk complain that the plant has thorns…but then…some folk complain about anything.